No longer in production by CZ, this will be our final shipment of the Tactical Sport(Dual Tone). Introduced in 2005, the new CZ 75 Tactical Sport in 9mm Luger. 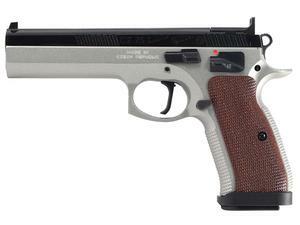 The CZ 75 TS is a competition ready pistol designed for IPSC standard division (USPSA limited division). The weight and balance of the CZ 75 TS is optimized for the rapid, accurate style of shooting necessary for success in practical shooting disciplines. The Tactical Sports model is the next generation of the proven CZ 75 Standard IPSC. The TS retains all of the best features of Standard IPSC model and improves upon the platform with increased durability, new sights, a new trigger system and more.